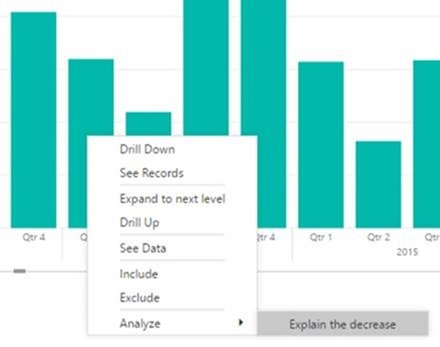 We are very excited to announce the release of another feature we demoed at the Microsoft Data Insights Summit back in June, drillthrough. 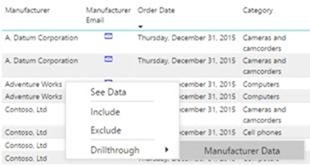 Drillthrough filters allow you to create a page in your report that provides details on a single ‘entity’ in your model, such as a customer, manufacturer, product, or location, and then use any data point referring to that ‘entity’ column through the report to navigate to that drillthrough page with the matching filter context. To create a drillthrough page, start by creating a page filled with charts related to the category you are interested in. For example, say I want a page dedicated to data about a single manufacturer. Once the page is made, I add the category column to the Drillthrough filters area. Now from any other page in my report where I have a chart using that same category, I can right click a data point and drillthrough to the manufacturer page. When you drillthrough, we will pass through the specific category you right clicked on as a filter on the drillthrough page. In my example, since I right clicked on a row where the Manufacturer was Adventure Works, the drillthrough page was filtered to only Adventure Works. Another feature of drillthrough pages is the back button. When you add a drillthrough filter, we will automatically add a back button to the top left of your report page. When you click this button in reading mode or ctrl+click on this button in editing mode, you will be taken back to the page you were on before. This is a very useful feature for your users consuming your reports since it helps with navigation. However, if you don’t want the drillthrough button, you can delete it. You can also make your own back button by adding a shape or image to the report and turning on the Back button toggle. 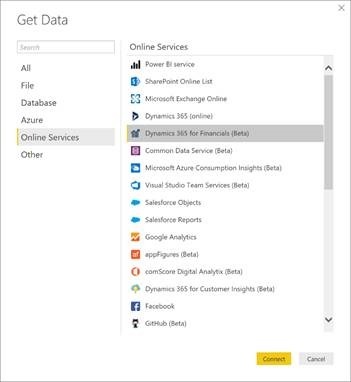 Drillthrough page for transaction details or "See Records"
Another feature we are releasing this month that was demoed at the Microsoft Data Insights Summit is report insights. This feature lets you right click on a bar or a data point in a line chart and ask us to explain why the data point increased or decreased compared to the data point before it. We will run our insights machine learning algorithms over the data and populate a flyout with charts showing what categories most influenced this increase or decrease. With each insight you can do a few different things. First, you can view the insight in different ways using the chart switcher at the bottom. You’ll be able to see the insight using a waterfall chart, scatter chart, stacked column chart, or our new chart type, the ribbon chart. You can also give us feedback on the insight using the thumbs up and down icons near the top to help us improve our algorithms. Lastly, you can use the plus button on the top right to add an insight to your report page as a visual. 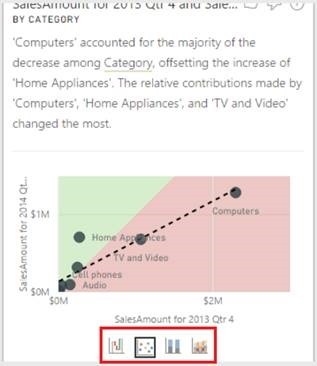 This new visual is now part of your report and can be changed or formatted just like all the other visuals in your report. This insights feature is available when using the report both in reading and editing mode, so you can use it purely for analysis or as an additional tool for creating your reports. This is just a preview, and we want to hear what you want to see next! Let us know what type of visuals and analysis we should add in the comments and our ideas forum. You can also check out our documentation to learn more about the feature and its limiations. 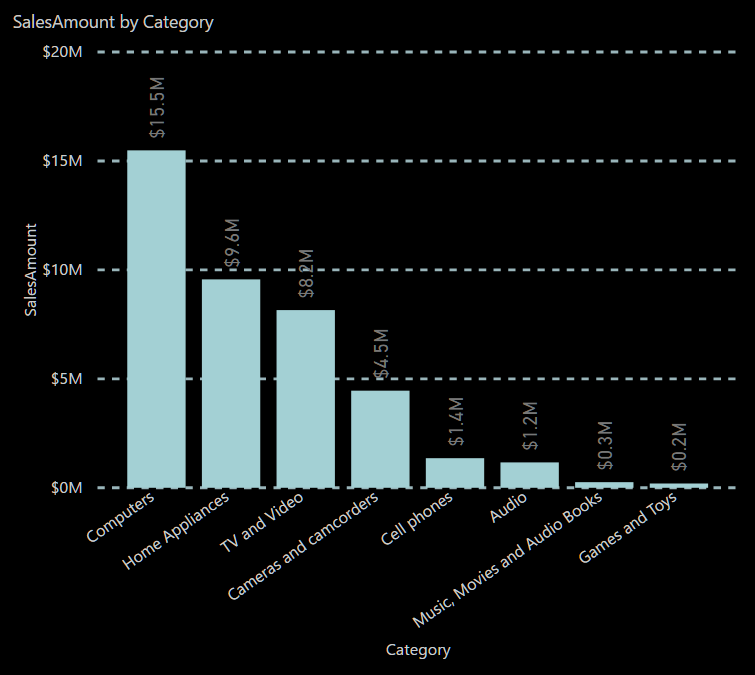 This month we are very excited to announce a new visual type: the Ribbon chart! This new visualization is geared towards showing rank change. The visual is like a stacked column chart, but each column’s inner categories are sorted according to their rank for that column. Additionally, the inner categories are connected by ribbons across the columns to help you visually see how the rank changes across the columns. You’ll find this new chart option to the right of the combo chart. Spacing – You can use this option to set a percentage of the column’s max height as the gap width between the ribbons. By default, there is no spacing. Transparency – You can control the transparency of the ribbon’s color. By default, it is set to 30. Border – By default, the ribbons don’t have a border, but you can turn borders on. Back in March, we released the first iteration of our report theming feature. Since then, many of you have been waiting for our next update. This month, we are very excited to extend our theme file format to include full control over your chart styling. This feature’s power is that you can create one theme file with all your favorite chart formatting features on and almost never have to touch the formatting pane again! For the visualName and cardName sections, you can either list a specific visual and cardName or using a “*” if you want the setting to apply to all visuals or all the cards that could contain this property for a specific visual. 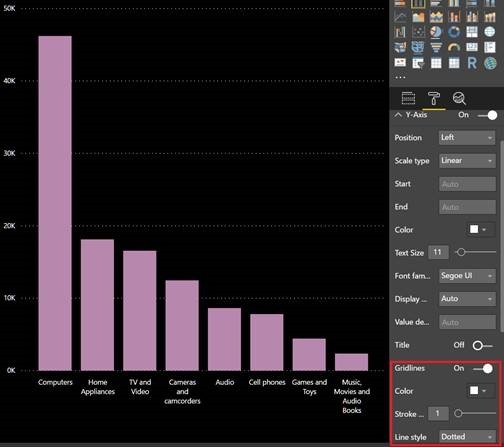 This is useful for things like font family or size that you may want to apply to all chart on your report. Below is a new theme you can test out. Our themes gallery in the community is also a great place to find new themes. I've updated several of my themes in the gallery: Accessible theme, Autumn, Sunflower Twilight, and Plum. If you don’t define a default setting in your theme, it will use Power BI’s default. This means you only need to define the defaults for the formatting settings you care about. Check out our documentation for all the details on what can be included in the theme json file. 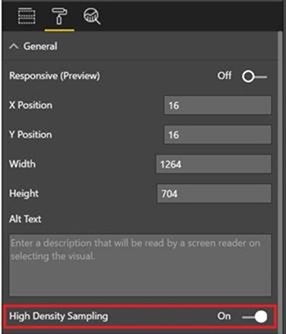 Back in June, we released support for screen readers and keyboard navigation so users who use accessibility aids can consume Power BI reports. This month, we are extending our accessibility support to make it easier for users to get the data they care about. An important part of consuming reports is getting at the actual data points. Up until this point, this has been a challenge for users who can only access their reports using screen readers, so we’ve now enabled an accessible “See data” view. You can access the accessible data behind the chart using the keyboard shortcut Alt+Shift+F11. Once you enter this mode, your focus will be on the data table and you can navigate it using your keyboard and screenreader. With all the new keyboard shortcuts we’ve added over the past several months, it can be hard to keep track. To help you remember which shortcut does what, we’ve added a keyboard shortcut helper dialog that can be reached by pressing the “?” key when looking at your report. Based on your feedback, we updated our sampling algorithm for scatter charts. This new algorithm will better preserve the shape of your data while also surfacing outliers. To do this, we prioritize showing points that aren’t going to be hidden by neighboring points. With this change, you should see a noticeably improved experience with any scatter charts that exceed the data point limit. This sampling algorithm allows you to represent a large number of data points without sacrificing performance and load time. If you would like to use the previous sampling algorithm or test out the improvements, you can turn off High Density Sampling in the General card of the formatting pane. We will continue to invest in this area and improve other visuals as well, so make sure to give us feedback on the new experience! We have added support to style your gridlines in you charts. This includes turning the gridlines on or off and changing the color, stroke width, and style. This is an especially useful feature if you tend to create dark themed reports and need your gridlines to stand out better. You’ll find these options in the formatting pane for measure axes. You won't see this option for categorical axes, but it will affect hierarchy outlines if you have that feature turned on. This month we have five new community visuals we want to share with you. 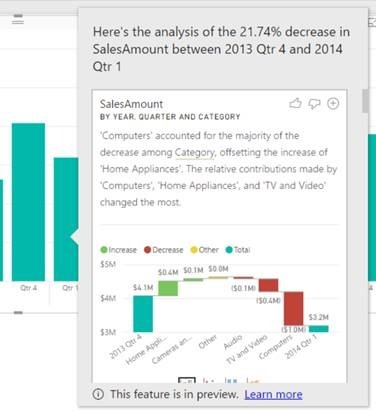 The Visio visual gives you the ability to represent Power BI data just how you want it. 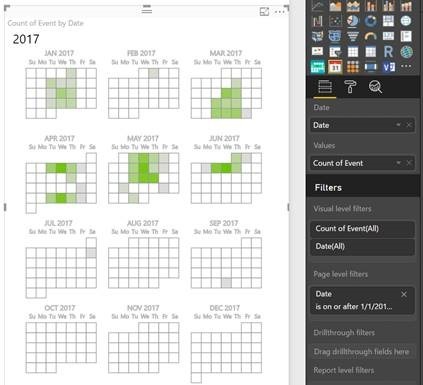 It allows you to design a Visio diagram showing your business process workflows or a real-world layout like your floor plan and quickly connect to it in Power BI. 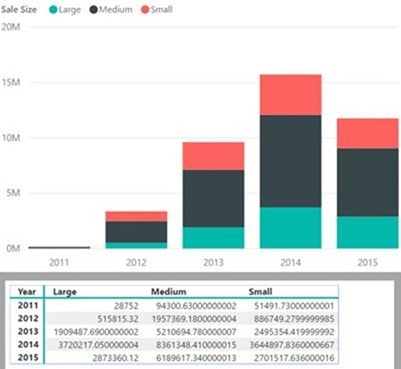 The underlying Power BI data is automatically and intelligently linked to the diagram based on its shape properties, eliminating the need to do this manually. 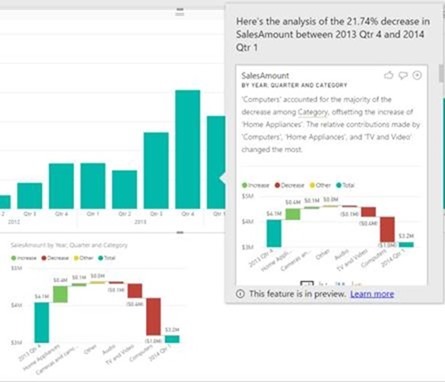 This is an incredibly powerful visual that let you turn your Visio diagrams into an interactive Power BI visualization that can help you make informed decisions faster. You can learn more about this visual on our dedicated blog and download it from the Office store. Tallan’s calendar visual is a great way to display and slice date data. All you need to do is add your date field and measure you want to visualize per day to the visual. The default view is a year view of all your data. 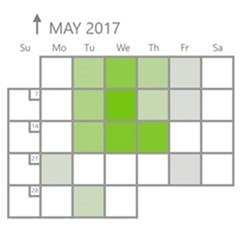 You can then zoom in on a specific month by clicking on its name. You can check the visual out in the Office store. We’re very excited to announce that the Enlighten Aquarium visual has been released on the Office store! This visual was one of the early community visuals added to our previous custom visual site and is a very playful way to visualize data. In this visual, each fish is a different category and the size of the fish is proportionate to the measure you give it. You can try it out in the Office store. The Impact Bubble Chart is an advanced bubble chart that lets you see how your bubbles move around the cartesian coordinate system over time. Each bubble represents a category and you represent that category with up to three measures using the Size, Left Bar length, and Right Bar length features of the chart. You can check it out in the custom visuals store! With this month’s update, we have released a new connector for Azure Consumption Insights. This new connector allows Azure Consumption Insights users to create custom reports to monitor their Azure Consumption data using Power BI. 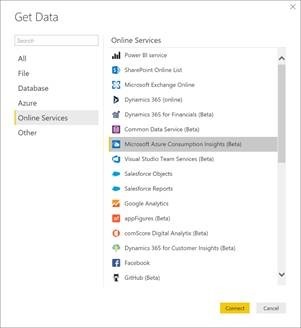 The new Azure Consumption Insights connector can be found under the Online Services category in the Get Data dialog. Enable Azure Active Directory based authentication, instead of previously available Basic authentication. Auto-discovery of your Dynamics 365 for Financials endpoint, after signing in with your credentials. The Dynamics 365 for Financials connector can be found under the Online Services category within the Get Data dialog.